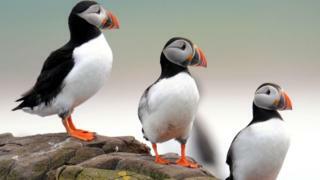 Image caption Puffins have moved to inner islands because of intrusive grey seals. Puffin numbers on the Farne Islands have increased by 9% over the past five years, despite earlier fears their population was in decline. National Trust rangers carry out a survey every five years and initial results in May showed overall numbers could be down by as much as 12%. It was thought last year's "Beast from the East" storm had destroyed nests. But experts now say numbers appear to be "stable" with thriving grey seals blamed for damaging some nesting sites. The trust said lower numbers recorded on the outer islands in May were the result of grey seals inadvertently crushing puffin burrows leading more birds to nest on inner isles. Final results from the 2018 survey, which involved checking a proportion of burrows on eight of the 28-island archipelago, reveal there are about 44,000 pairs - up 9% on the last count in 2013. Numbers of the seabird, which is listed as globally vulnerable to extinction, have risen steadily on the islands in the past 25 years. Some 37,710 pairs were recorded in 1993 and the population peaked at 55,674 pairs in 2003, but that was followed by a sudden crash in 2008 when numbers fell by a third before slowly recovering. Ranger Thomas Hendry said: "When we started the count in the outer group of islands we were very anxious that numbers were down, especially as we know puffins are struggling for survival across the globe. "After further investigations on the inner group of islands, numbers seemed to be much more positive. This could be due to the islands being more sheltered." He said grey seal pup numbers had grown from 1,704 to 2,602 in the last five years. "A rather unfortunate consequence of this growth is the seals are competing with puffins for areas to raise their young", he added.